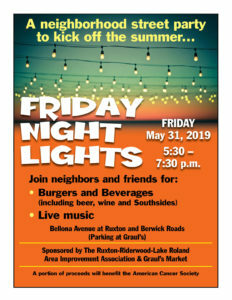 The Ruxton-Riderwood-Lake Roland Area Improvement Association is pleased to sponsor this event. The Loading Dock, a non-profit building material reuse center, will collect usable home construction items (such as lighting fixtures, doors, flooring, plumbing fixtures, cabinets, etc.) until noon or until the truck is full. Check out acceptable new and used building materials at loadingdock.org. Click on Donate, then Material Donations or call 410-558-3625, ext. 17. Shredding service is free to our current members (up to three 12” x 12” x 16” boxes). Please don’t use this service for papers that can be appropriately recycled (those without personal identifying information). 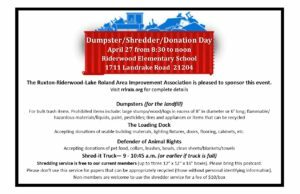 There will be NO electronics recycling at this event. The Loading Dock, a non-profit building material reuse center, will collect useable home construction items (such as lighting fixtures, doors, flooring, plumbing fixtures, cabinets, etc.) until noon or until the truck is full. Check out acceptable new and used building materials at loadingdock.org. Click on Donate, then Material Donations or call 410-558-3625, ext. 17. Better yet, DONATE. The Reuse Directory lists organizations throughout Baltimore County that accept various materials for reuse.